WASHINGTON — The Catholic Church is protesting an Obama administration rule that requires nearly all employers — even Catholic ones — who provide insurance to their employees to include coverage of birth control services. The United States Conference of Catholic Bishops (USCCB) has come down against the administration for not exempting all religious organizations from the rule. In a video posted to the group’s website, USCCB president Archbishop Timothy Dolan said the “administration is on the wrong side of the Constitution” and that the rule to provide birth control is a violation of the First Amendment of the Constitution, which provides for the free exercise of religion. Anecdotally, Catholics from the Midwest to the Washington, D.C., area said their churches addressed the issue in the past week via church bulletins that urged churchgoers to contact their members of Congress to support legislation to reverse the administration’s rule. The Obama administration rule stems from a provision in the Affordable Care Act (ACA) that requires no-cost coverage for preventive health services. The Institute of Medicine (IOM) recommended that the Department of Health and Human Services cover the “full range of FDA-approved contraceptive methods” in order to prevent unintended pregnancies at no cost to the beneficiary, and that includes birth control. The final rule, issued by the Department of Health and Human Services (HHS) on Jan. 20, says that starting on Aug. 1, 2013, health plans must cover all FDA-approved contraceptives, including hormonal contraceptives such as birth control pills, implanted devices such as intrauterine devices (IUDs), Plan B emergency contraceptives (the “morning-after” pill), and sterilization — all without charging a copay, coinsurance, or a deductible. The plans will not have to cover abortions, however. Churches and church-affiliated secondary schools are exempt from the rule, but other organizations with religious affiliations — including universities, charities, and hospitals — must comply. Such organizations petitioned HHS for an exemption after the preliminary rule was issued last summer. As a compromise, they have been given an extra year to comply. “In effect, the president is saying we have a year to figure out how to violate our consciences,” Dolan said in a statement. Sister Mary Ann Walsh of the USCCB told MedPage Today that requiring Catholic providers to write prescriptions for birth control would be asking them to violate the church’s teaching. Walsh said the USCCB supports legislation authored by Rep. Jeff Fortenberry (R-Neb.) that would amend the ACA to permit health plans to refuse to cover specific items, such as birth control or services that “are contrary to the religious beliefs” of the entity offering the plan, without penalty. The bill, HR 1179, would allow those plans to still be considered “qualified health plans” and therefore able to be sold in the health insurance exchanges created by the healthcare reform law. The bill has 102 sponsors, seven of whom are Democrats. The Catholic Health Association of the United States declined a request for an interview, but pointedMedPage Today to a statement made by CEO Carol Keehan, who said the group is disappointed that HHS exempted only churches, but not religious hospitals, from its preventive services rule. During the debate in 2009, The Bishops fought to have abortion not covered by ACA and the Catholic hospitals split with them (you can look that up). The compromise finally went the Bishops’ way on abortion, as I recall. Birth control, not including elective abortion, of course, remained in ACA, with an exemption for Churches, but not for RC employers or RC Hospitals (which presumably do not want that exemption, judging by 2009’s experience). Is there some way the Bishops have been subjected to a sneak attack here, or was this a fight that was just going to happen once ACA was implemented, no matter what? It seems to me that HHS is implementing ACA here as written. Is there an executive overreach here that I am missing? Was there reason to think a “church” included a “hospital” affiliated with the RCC? Your collective input is required for my edification. Markets are stronger this morning on progress in Europe. The Portuguese long bond is up a point and the Euro is strengthening. In earnings, Exxon missed, Eli Lilly beat. People are waiting anxiously to see the red herring for Facebook’s IPO. Certainly the other social media stocks have not been shooting the lights out, but leaders always trade rich to also-rans. Watching Linked-In or Groupon may not turn out to be the best comp. The employment cost index came in at .4%, in line with expectations. 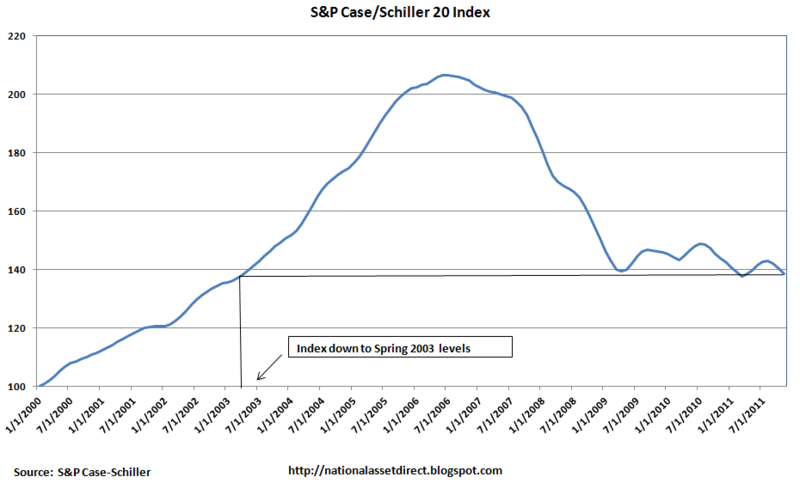 Case-Schiller was also released this morning, with a 70 basis point decline MOM and 3.67% decline YOY. This puts the index back to April 2003 levels. Case-Schiller is a very lagged indicator and this number covers the 3 month average ending in November, so it is a snapshot of how the real estate market looked last fall. Anecdotally, I am hearing things are improving in my neck of the woods, NYC metro. Another sign that the inventory of foreclosed homes is moving – the professional investor is getting involved. Bloomberg has a story this morning on how private equity is getting involved in the Administration’s REO-to-Rental program. These funds are looking at spending billions. Still, the absolute numbers are staggering. “About 7.5 million homes with a current market value of $1 trillion will be liquidated through foreclosures or other distressed sales by 2016” according to Morgan Stanley. $1 trillion in distressed sales. Wow. Work has been miserable. A lot of not great information from our Rapid Notice Service provider has made adding SMS numbers to student outreach much, much more problematic than it has to be. So I’ve been busy. However, a U.S. Navy Ship-Mounted Rail Gun is closer to reality. It’s about time we started flinging superheated aluminum at distant objects at supersonic speeds. Here’s an original 1982 Featurette on The Making of Tron. Michelle Obama indulges in $50,000 shopping spree. I’m pretty sure the cost of vacationing on Air Force One is a lot higher, and the tax payers foot the bill for that. Warren Buffett says: "I'm too rich! And so, I demand the government take your money! 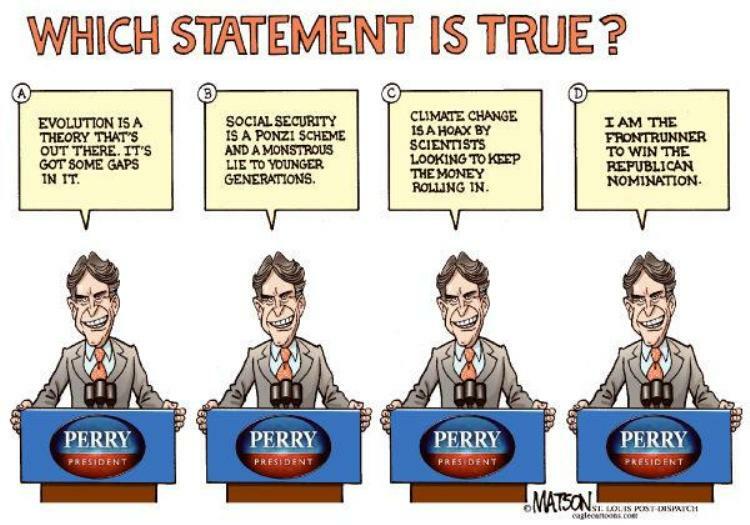 Mine, of course, will remain in untouchable tax shelters." 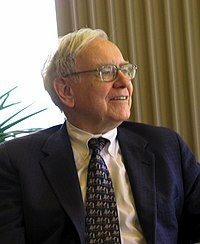 Warren Buffett is not an oracle of public finance. It covers a lot of the stuff we touched on previously. But here it is again, if you just can’t get enough. If you don’t use coupons, you’re leaving money on the table. Why not set some cash on fire, while you’re at it? Stock index futures are lower this morning as Europe becomes the focus again. The Germans have proposed creating a commissioner with veto power over Greek budgetary decisions as a condition for aid. Greek Financial Minister Evangelos Venizolos rejected the idea. Portugese spreads are 180 basis points wider this morning as well. Merger Monday is back with a couple of deals – The Gores Group (a West Coast private equity group) is buying Pep Boys. Swiss engineering giant ABB is buying Thomas and Betts. Eastman Chemical bid for Solutia on Friday. Merger activity seems to be picking up, another sign that the economy is gathering strength. Personal income came in at .5% for December, slightly higher than the .4% estimate. Spending however was flat, lower than the .1% estimate. The spending number may be explained by the marked strength in spending in 2010. Spending started to gather momentum from Q310 – Q111 before falling off as the European crisis began to coalesce. So the weakness may simply be a tough comp problem. The earnings parade continues this week with McKesson, ADM, Exxon, Eli Lilly, UPS, Amazon.com, Pulte, and Dow as the major players releasing Q4 results. About 15 years ago I started trying to incorporate vegetarian meals into my week on a somewhat regular basis, partly for health reasons, partly for ecological reasons, and partly just to learn a new way to eat–when you’re a Midwestern farm girl any meal which isn’t built around a proteinaceous entree just isn’t a meal! One of the best things I did at that time was to buy a cookbook titled “The Occasional Vegetarian” by Karen Lee (it has since gone out of print, but copies are still available); in this particular cookbook not only does she have great recipes, but she lays out entire menus so that those of us without a clue can figure out how to put together a balanced meal without meat. Another thing that I like about this cookbook is that many of her recipes can be multi-purposed, in these instances, hors d’oeuvres turn into entrees a couple of days later. Brush the bread slices lightly with the oil and lay them on a cookie sheet; bake until light brown and crisp through, 20 – 30 minutes. These can be used immediately or stored for up to about five days. . . although mine never last that long. Chinese eggplant ratatouille with Italian overtones. . . use as an appetizer on the toast rounds, or make even more (double the recipe), save it for a couple of days for the flavors to meld, and use it to top pasta. Yummy! Cut the eggplant into 1/2-inch cubes, toss with some salt and place in a colander. Set aside for an hour, then rinse and allow to drain for about 10 minutes. Dry thoroughly between paper towels. Combine the tomato sauce, soy sauce, vinegar, sugar, sherry, and chili oil; set aside. Heat a wok or iron skillet over high heat until it is (literally) smoking hot. Pour in some of the peanut oil and toss in some eggplant cubes (don’t over-crowd the pan). Press down on the eggplant to aid in scorching, and cook, stirring and pressing down occasionally, for about 5 minutes until the eggplant is soft and well-charred. Remove the eggplant from the pan and repeat until all of the eggplant is cooked. Add more oil to the pan and add the onion and fry, stirring frequently, until it begins to brown (about 2 minutes). Add the garlic and stir-fry for 1 minute more. Add the eggplant back into the pan along with the tomato sauce mixture and stir until the sauce is absorbed, about 1 minute. Add the pepper, oregano and capers and stir for a few seconds. Season to taste, and serve warm or at room temperature. Not only is this spread fantastic on those toast rounds, but it can be used as a dip, or a great low-fat topping on potatoes. Cut through the garlic head near the top, drizzle the oil over the top, place the garlic in some aluminum foil, seal, and roast for 40 minutes. Unwrap and let cool. Combine the sour cream, yogurt, cumin, curry powder, and salt and pepper to taste. Pinch the cloves out of the garlic head and mash them into the yogurt mixture. Let the spread sit at room temperature for at least an hour before serving so that the flavors can meld. What to do with that leftover Chino Caponata. . .
Heat the olive oil in a medium skillet. Add the garlic and saute until golden. Add the tomato sauce and bring to a simmer. Stir in the Chino Caponata and bring to a simmer again. Add the mascarpone or cream and stir. Remove from the heat and toss with pasta. Top with the cheese and serve immediately.